Let us quickly recap where we are on repealing Obamacare. Unless Majority Leader Mitch McConnell (R-KY) can pull a rabbit from his "Make America Great Again" hat, it looks like the ACA is going to be here for a while. Normally under these circumstances, the president says what he wants and orders Congress to do it. But Donald Trump's clout with Congress is close to zero with the Republican men in the Senate and exactly zero with the three Republican women who vetoed the idea of a pure repeal of the ACA. Is there some kind of karmic justice in the situation in which a dozen male Republican senators cooked up a new health-care bill and in the end three female senators shot down the entire project? We report, you decide. Donald Trump Jr., Jared Kushner, and Paul Manafort had a meeting with Russian lawyer Natalia Veselnitskaya in Trump Tower during the campaign. Also present was Rinat Akhmetshin, who may have been a (former?) Russian spy. It has now come out that Irakly Kaveladze, who works for Russian-Azerbaijian oligarch Aras Agalarov, was also present. Agalarov is one of the president's business partners. Why Kaveladze was there is not known. Trump Jr. was expecting to collect dirt on Hillary Clinton at the meeting, but has said he didn't get any. While at the G20, Donald Trump had a high-profile two-hour meeting with Russian president Vladimir Putin. Everyone knew about that one. On Tuesday, it was reported that there was also a second hour-long meeting, an apparently impromptu one that took place at a dinner that evening. The White House followed this up with an official statement in which they declared that, "The insinuation that the White House has tried to 'hide' a second meeting is false, malicious and absurd. It is not merely perfectly normal, it is part of a president's duties, to interact with world leaders." And amid all of the chaos, the controversy and the tweeting, the tweeting, the tweeting is this fundamental fact: Donald Trump ain't changing. He is a 71-year-old man. A very successful 71-year-old man. A man who views the 2016 election as the ultimate validation that he is smarter than all of the so-called political elites. Socrates once explained that he was regarded as the wisest man in Athens because, "I alone know that I know nothing." If that is the case, then what does it say abut the man who thinks he knows everything? First, when you don't understand the world very well, and when your team lacks skilled officials to compensate for presidential ignorance, you're going to make big policy mistakes. Trump's biggest doozy thus far was dropping the Trans-Pacific Partnership (TPP), a decision that undermined the U.S. position in Asia, opened the door toward greater Chinese influence, and won't benefit the U.S. economy in the slightest. Similar ignorance-fueled errors include walking away from the Paris climate accord (which makes Americans look like a bunch of science-denying, head-in-the-sand ignoramuses) and failing to appreciate that China wasn't—repeat, wasn't—going to solve the North Korea problem for us. Not to mention his team's inability to spell and confusion over which countries they are talking about. The whole piece is worth reading, but Walt's conclusion is this: The world's leaders have largely already decided that Trump is not competent. So they will flatter him and polish his apple when they need something, and otherwise will ignore him and do their own thing. And in general, "their own thing" is not going to be the thing that best serves U.S. interests. 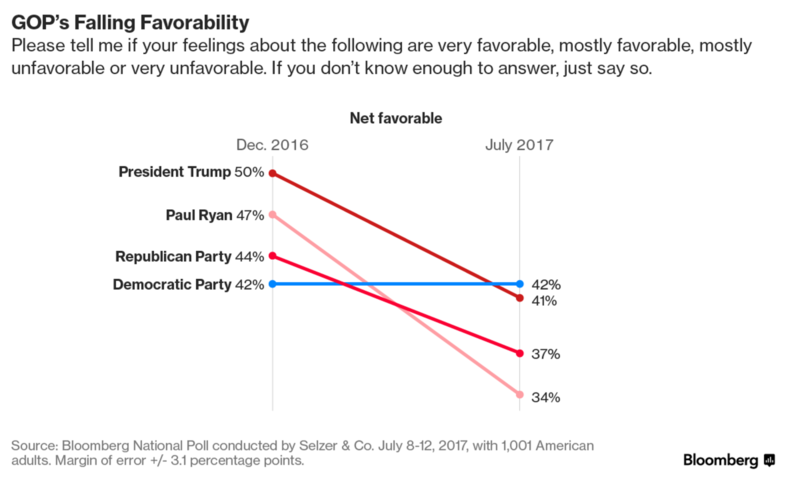 Let's start with the good news for Donald Trump and his colleagues: There is someone who is even more unpopular than he is. That someone is...Hillary Clinton. Her approval rating has dropped even more precipitously than Trump's has in the last six months, such that in the latest Bloomberg National Poll, he's at 41% approval and she's at 39%. Victory! That said, even this good news carries with it some bad news. Hillary Clinton hasn't done much of anything since being defeated back in November, which means that her flagging approval ratings must be a product of all the "But Hillary..." smears that the President and other Republicans have used to justify their own behavior. The problem is that such attacks will surely lose their efficacy over time. The GOP could turn their guns on Barack Obama, but for one problem: His approval rating is as high as it's ever been (61%). So, that's likely a loser. And from there, the polling data just get worse and worse for Trump & Co. As the President considers destroying Obamacare, he might want to take note of the new NBC News/WSJ poll that reveals that only 12% of voters in the counties that Donald Trump won are happy with the direction the GOP has taken on health care. Thus far his base has stayed pretty firm; this poll would suggest that if there's one way to change that, it's counter-productive action on health care. Like, for example, letting the insurance markets collapse. The latest entry from Public Policy Polling also contains unhappy news for the President. There's the usual low approval rating, of course, but PPP also ran a number of hypothetical 2020 presidential matchups. According to their results, Trump would just barely lose to Sen. Kamala Harris (D-CA), 41% to 40%. That's his best matchup (unless you count Mark Zuckerberg, whom he would tie, 40%-40%). The Donald would take an even bigger beating at the hands of Sen. Cory Booker (D-NJ), 45% to 40%, and he would be absolutely trounced by Sen. Elizabeth Warren (D-MA; 49%-42%), Sen. Bernie Sanders (I-VT; 52%-39%), or former vice president Joe Biden (54%-39%). Trump would even lose handily to the much-reviled Clinton, 49% to 42%. Today, President Trump's Electoral Integrity Commission, whose job has little to do with electoral integrity and a lot to do with keeping Democrats from voting, will hold its first public meeting. This will be the first of five planned meetings at which they will collect data, hear testimony, and prepare a report for The Donald. As he tries to drum up a little positive press, Donald Trump has declared this to be "Made in America" week. And, as part of that, he held an event at the White House in which he showed off products made in each of the 50 states, including Kentucky baseball bats, Texas cowboy hats, and Illinois tractors. As is his habit, the President neglected to consider how things might look through other people's eyes. And so he did not anticipate that the first thing that many observers noticed is that there were no Trump-branded products on display. The problem is not that the President wanted to avoid self-promotion—he has absolutely no issue with that—it's that his products are made, well, not in America. The Trump Home Collection, for example, is produced in Turkey. Ivanka Trump's clothing and jewelry lines are made in China, Vietnam and Indonesia.